Organize in a refreshing yet boho style with the Kendall Collection, featuring a soft floral in denim blue and antique creme cotton canvas. Trimmed in brown leather and pewter hardware. Lined in parchment and ash grey ikat printed cotton fabric. Kendall Market Tote, part of the Bella Taylor line by VHC Brands. Kendall Rucksack, part of the Bella Taylor line by VHC Brands. Kendall Shoulder Tote, part of the Bella Taylor line by VHC Brands. 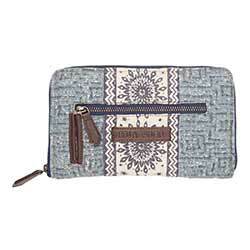 Kendall Signature Zip Wallet, part of the Bella Taylor line by VHC Brands. Kendall Wanderlust Tote, part of the Bella Taylor line by VHC Brands. Kendall Weekender, part of the Bella Taylor line by VHC Brands. Kendall Wide Tote, part of the Bella Taylor line by VHC Brands.